Let’s face it: how much do we really know about Northeast Indian cuisine other than momos and thukpa? Yes, the last couple of years have seen handful restaurants in the capital serving cuisines from Nagaland and across the Himalayan region. And there are occasional pop-ups featuring Assamese fare and so on. But did you know that Sikkim has been declared as the first Organic State of India? Or that the state has just one tea garden and yet boasts one of the finest qualities of white tea? Binita Chamling proudly shares these and other trivia about her home-state. She’s the co-founder of Nimtho, a cosy restaurant in New Delhi’s GK-1 serving home-style food of Sikkim. And if you thought that Sikkimese food was limited to momos and thukpa you owe yourself a trip to Nimtho. “Nimtho” translates to “an invitation” in the Nepali language. 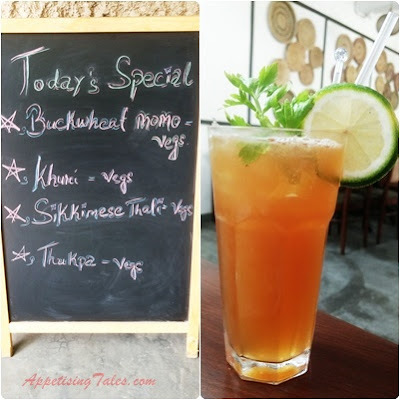 The restaurant aims to share a glimpse of Sikkimese hospitality and warmth through their food. “Many people think that in Sikkim we speak Sikkimese, but actually there is no language called Sikkimese,” shares Binita, adding that almost 70% of the Sikkimese population actually migrated from Nepal many, many years ago. That is why Nepali is spoken widely in the state and even the cuisine is heavily influenced by that of Nepal. It also has some influences from the neighbouring state of West Bengal and even Bihar. So without much ado we decide to order a Sikkimese thali because we feel that a thali is undoubtedly the best way to sample an array of a relatively unfamiliar cuisine. A beautiful brass platter comes with matching cutlery and bowls. It is filled with assorted pickles, some salad, churpi soup, sautéed spinach and mixed vegetables made with carrots and potatoes, a delicious chicken curry, succulent pork, rice, papad and sesame crusted karela fritters. The meal is delicious and has the appeal of home-style cooking, some familiar flavours and even some that take your palate on an adventurous ride. 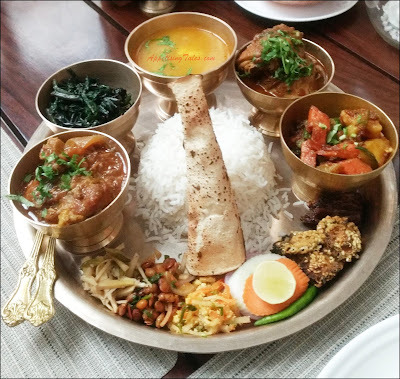 Although the thali contains more than sufficient food for one person, we also decide to explore the menu a bit more since it features traditional and even some forgotten foods of Sikkim. From the range of soups we try the Sisnu ko Raas, a soup made with the stinging nettle’s flowers, stalks and shoots stewed in pounded rice. It is delicious and we enjoy it even more when we learn about the many health benefits of nettle. You could even try the Mutton ko Raas, a Nepali soup made with mutton and daal. An interesting vegetarian option is the Churpi ko Raas that was also served in the thali. Churpi is a traditional cheese made in the Himalayan region, either with yak or cow’s milk. Here it tastes much like cottage cheese. There is also a Mula Churpi salad made with juliennes of radish and churpi. The range of starters includes spicy salad mixes with crunchy noodles, and dishes made with soya bean and potatoes. Gundruk is a specialty made with fermented and dried mustard. For non-vegetarian options there are chilli chicken, chilli pork, pork ribs, fish and Syapta, a choice of stir fried meat with fresh ingredients. Bottom: Sisnu ko Raas; Wacheepa. And then there are, of course, the momos and thukpa. 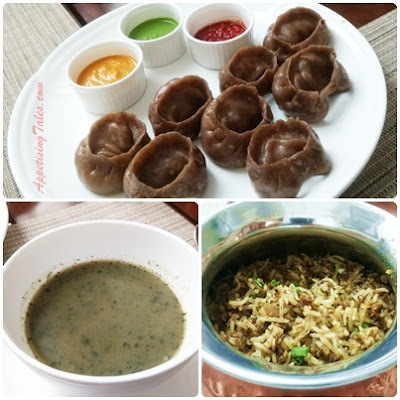 Apart from steamed and fried varieties of momos, there are jhol momos that come in a soupy broth, tigmo momos or steamed buns, saphalay or pies stuffed with minced meat and taipo or steamed buns with a choice of fillings. We try the buckwheat momos with pork, that are a modern take on this traditional food item. They are soft to the bite and filled with juicy, almost soupy, meat. The three accompanying sauces made with red chillies, coriander and churpi and schezwan pepper as delicious as the momos. The next time you have a momo-craving, this is certainly where you should head. We will be going back too, also to try meals in a bowl like the thukpa, gyathuk and thenthuk. Then there’s a choice of Sikkimese curries and assorted noodle and rice dishes. The Wacheepa is a rice dish made with char-grilled chicken; its flavour is further enhanced with the powder of burnt chicken feathers. In short, Nimtho serves an extensive choice of home-style Sikkimese food. If you have an adventurous palate you’ll be delighted, and there’s also enough comfort food for people with conservative eating choices. Do try it out and let us know about your favourites. Nimtho, 304, Block R, 1st Floor, Greater Kailash I, Greater Kailash, New Delhi, Delhi 110048. Prices: Starters Rs 179 onwards; Momos Rs 239 onwards; Thalis Rs 439 onwards. This article first appeared on indiatoday.intoday.in on August 1, 2017.